I don’t know about you but sometimes my struggles seem more real than God’s goodness. Especially when I wake up in the middle of the night or early morning. My rational mind and my faith seems to stay sleeping while everything else seems to wreak havoc. The fleshly fears can become overwhelming and intensely real. Worry, fear and insecurity are powerful and can mess with your perception of reality. They become real even though the things that you are worried about, fearful or insecure of are not real. I say that because nine times out of ten they are our perception of what could happen is not the reality of what will happen. Then of course there are those times when exactly what we fear does happen! But even then God is bigger. Christians struggle just like any other people but the difference is that we have a safe place to run to that many others don’t. We can run to our God and we do so through prayer and worship. 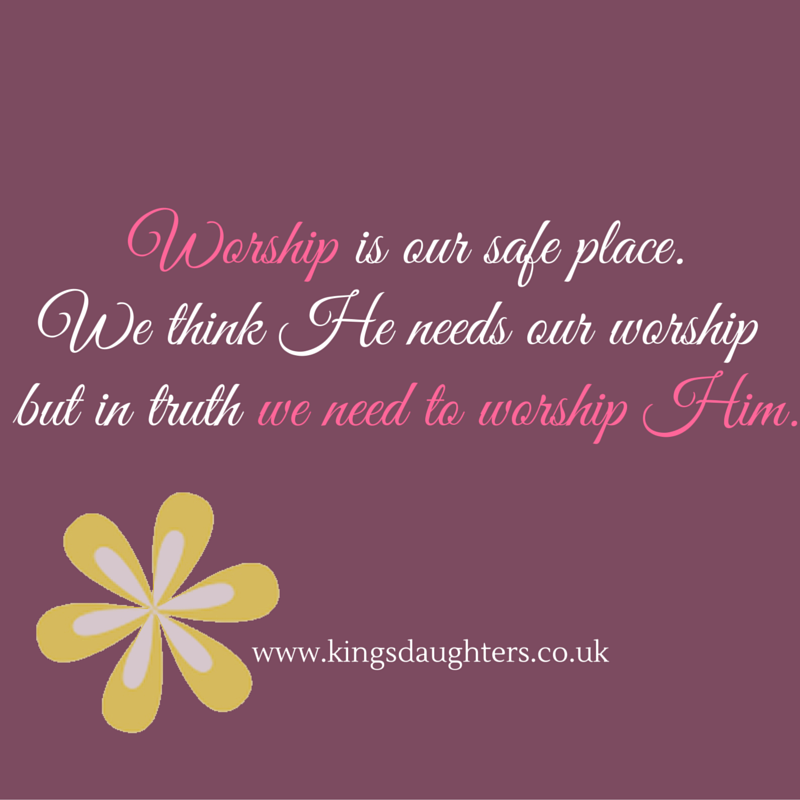 Worship is our safe place in the midst of everything. When I worship God suddenly all the worry, fear and insecurity seem to melt away and I am left with the most beautiful peace. Often I leave God’s presence with joy. Circumstances do not change while I am worshiping Him but I do. My faith grows in His presence. My joy is full in His presence. My burdens are lifted when I shift my focus from my problems to worshiping Him. Whatever your struggle right now – worship Him. Stop what you are doing and sing your favourite Christian song, pray to your God, love Him and marvel at His goodness. If you are in a really difficult place and simply don’t have the energy to do that then why not put on some worship music to help lift your spirits. I have collected some playlists on YouTube for those days when I struggle to find the will or energy to worship Him.